Cabbage has been used for its medical uses dating back to the ancient Greeks and Romans. Cabbage is native to the Mediterranean region and is known for being an excellent diet food due to its low caloric value. Many people are aware that cabbage can help with digestive problems but may be unaware of its many other uses. Cabbage may also be referred to as Collard Greens, Green Cabbage, Kale, Purple Cabbage, Red Cabbage, and White Cabbage. One of the many benefits of cabbage is that it reduces breast engorgement and pain in postnatal mothers immediately following the first two weeks after childbirth. It is not entirely known how cabbage reduces breast engorgement, but it is assumed to be a result of the high levels of sulfur found in the cabbage leaves. High concentrations of sulfur is known to reduce inflammation and swelling in tissues. It is also believed that the sulfur in cabbage helps to reduce the mild supply of milk which can lead to discomfort in women (Cabbage for Postpartum Breast Engorgement). Cabbage contains high levels of vitamin K. Vitamin K is produced naturally by the intestines and is an important factor in the regulation of bleeding. In a study entitled Vitamin K, osteoporosis and degenerative diseases of ageing, it was found that having a vitamin K deficiency for an extended amount of time can lead to a decline in function of the carboxylation of the Gla-protiens which can then lead to the development of degenerative diseases such as osteoporosis and atherosclerosis (Norton). Because cabbage contains such high amounts of fiber, eating cabbage allows one to feel fuller longer and have a reduction in food cravings thought out the day. This can lead to a decline in the obesity epidemic overtime. 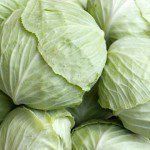 Additionally, because cabbage has such high levels of fiber, it can help relieve constipation and colon cancer (Norton). It has also been found that cabbage can protect the lining and mucous membrane of the stomach from hydrochloric acid. Cabbage contains vitamin U which is an anti-ulcer factor that allows the mucous membrane to regenerate at a faster speed as compared to someone who has not eaten cabbage (Cabbage). When consuming cabbage in medicinal doses, it seems to be very safe when taken by the mouth or used on the sin. There seems to be no side effects to consuming cabbage, but more studies need to be conducted (WebMd). Cabbage. purematters, 2012. Web. 25 Jun 2012. “Cabbage. WebMd, 2009. Web. 25 Jun 2012. “Cabbage for Postpartum Breast Engorgement.” BabyMed, 2009. Web. 25 Jun 2012.